I must apologize for continuing to bring you tins of Unobtainium, but here is another Smuggled Tin. 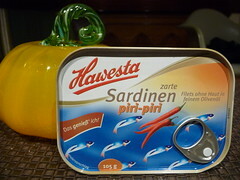 The Other tin brought back form Germany. Code Name: Gordy. I understand. Unobtainable. I can't stop. I know I will never see another of these tins. I just happen to have access to people who travel the world, and will drop a euro or pound or two to see a Juvi-Adult smile. It's not my fault. This tin has an amazing spice to it. Piri-Piri. You've seen it here before. I first found it as a hot sauce at The Spanish Table. 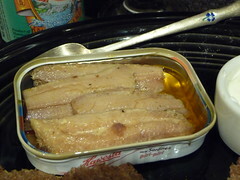 This tin, Filets ohne Haut in feinem Olivenöl, has heat. Four fish, super clean and pretty, and Oh, What Heat!! 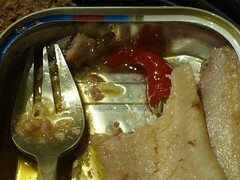 There was a small whole pepper in the tin! 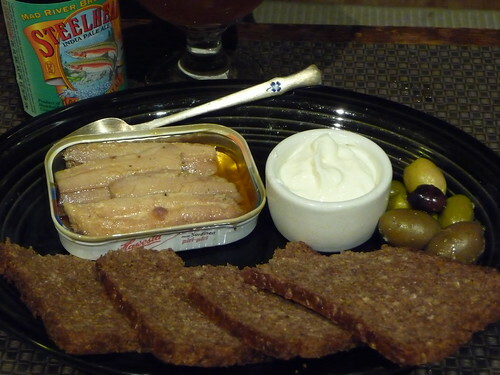 Plated with toasted dark rye, a bit of sour cream, and some roasted up olives. Good firm texture, if only there were some bones, a bit of crunch, I've been missing that in my recent attacks, don't need the skin here. Four out of Five tins. Big, Beautiful, Spicy, but Unobtainable. On a side note: I recently received a call from a young lady wanting to hook her father up with some tasty tins available at her local. I immediately thought of the Pollastrini. These are getting wide North American distribution and are killer. Her dad has sardine experience. If your out there trying to convert, well, maybe they aren't a gateway tin, but that's a damn good tin. I love it: Portuguese hot peppers in a German tin. I agree, just one of those lil’ peppers does the job quite nicely.